My grandmother told me witches lived in the ruins of an abandoned apartment building near her home. She went on daily walks around her neighborhood, so I believed her. She knew everything. Every house had a number and she had the corresponding footnote. She knew the names of the dogs who barked at fences and gates. I wouldn’t have been surprised if she knew the name of each floating goose at the park lake few blocks away. She could have pointed at a small, scraggle of a bird paddling away from the flock, and said, “He’s Lawrence.” I was young enough to shout, “Hi, Lawrence!” in his direction and fold him into the list of my forever friends. The day I heard about the witches, she herded me around one corner, around another, and then we stopped in front of a mostly-vacant lot. The only thing left of the structure was a basement with a few thick white crumbling walls standing above ground. Lilac bushes in full bloom grew in clusters around the walls. I made a note to never go there, which was probably my grandma’s goal. She was unconventional, like Lawrence the Goose. I considered the building and the lilacs and what I knew of witches. It didn’t seem like a witching sort of place, aside from the decay and loneliness. Yes, maybe witches could live there, but the lilacs seemed outlandishly out of place. They grew in my great-grandmother’s yard on the other side of the state. She was no witch. She went to the Baptist church. A van picked her up at her house every Sunday morning. When she prayed over Thanksgiving turkey, Christmas roast beef, Easter ham, and Fourth of July potato chips, her voice trembled with love for her Lord. It shook. Her voice never shook when she talked about John Wayne, perfect meringue, or bowling. My mom pointed it out once, telling me to pay attention to great-grandmother’s voice the next time I heard her pray. I learned the word, reverence. Did God like shaking prayers better than regular prayers? I formed that impression because everyone always wanted her to pray when we gathered together. The food was surely blessed and so were we. Nobody ever got sick or choked and our bodies grew. When I was a bit older, it slipped that calf brains were often part of Easter morning breakfast, mixed with scrambled eggs. The prayers of a good, reverent woman explained why I didn’t keel over, stone cold dead because I ate the brains of a baby cow. It was the only explanation. I considered the lilacs growing in the witches’ lot. They could grow everywhere, even where it was ugly and scary? Eventually, I learned you could snip lilac shoots and replant them into any little bit of earth and they’d grow with a decent measure of sun and water. They don’t mind skirting the steady, the whispering, the silent, the barren, or even the crumbling and decrepit as long as they are fed. Loveliness sprouts despite, making the ruins fade until all you see, standing on a sidewalk, is a reminder of something really good. The hard lonely ruins don’t diminish the beauty of what’s wild and providential. Rather, thriving evidence of provision makes ruins into a shining palace. Reverence isn’t in a voice, a skyward look, or in perfectly folded hands. 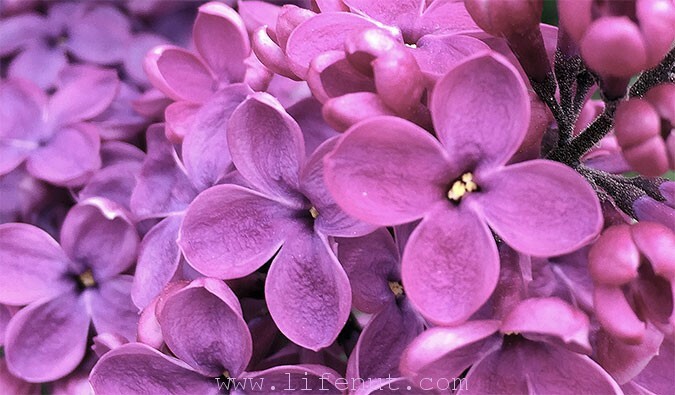 The wind swells and swirls as dainty purple blossoms rock in clinging bunches. Funny. Lilacs all smell the same when they’re in full, glorious bloom. No, grandma. Witches can’t live there.